If you look at some of the old maps of our parish, you might have noticed just to the south of Milton village green a feature marked as a fort. This is shown here on this 1890 Ordnance Survey map. 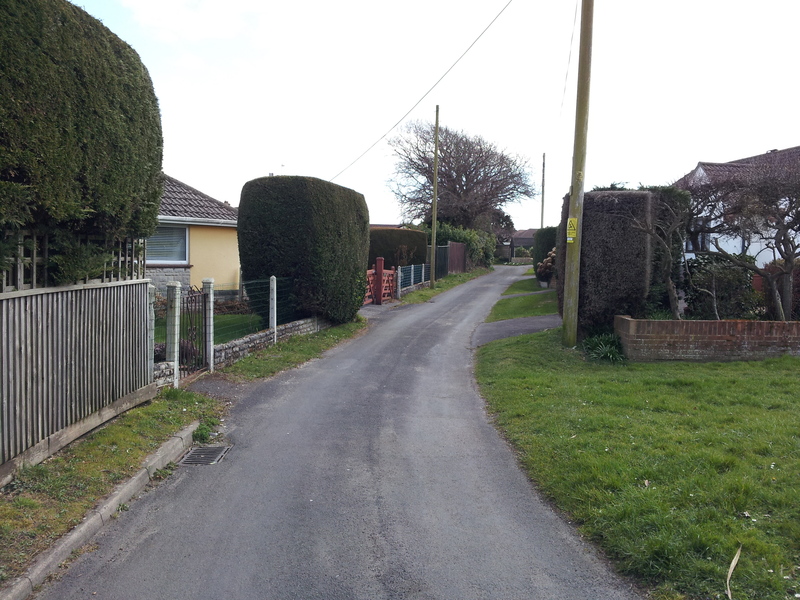 This is quite intriguing especially when it is situated so close to Milton Manor Farm. Could this be a fortified manor house dating back to the early history of Milton village? 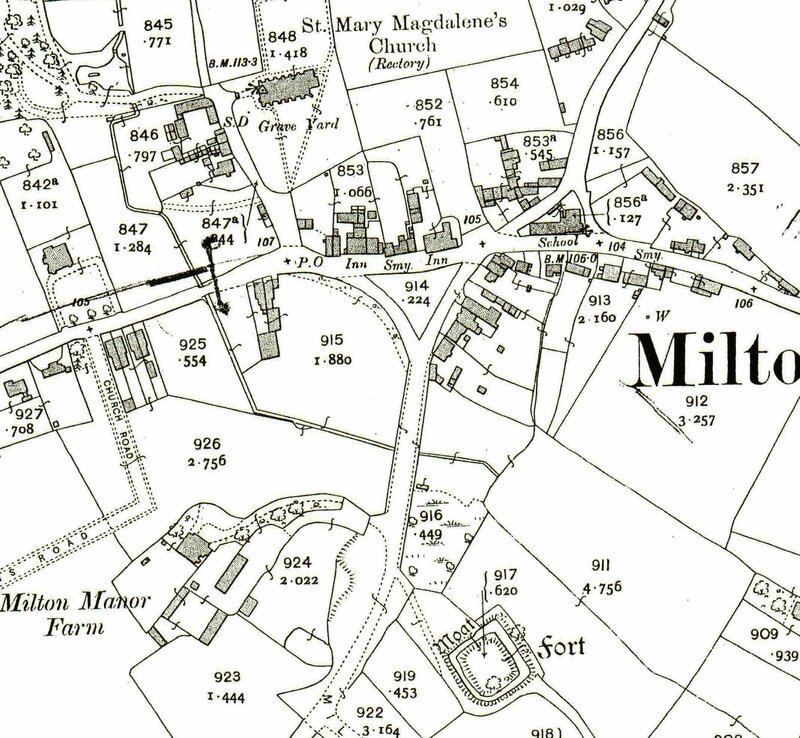 The Victoria History of Hampshire published 1912 refers to a moated area in Milton village possibly marking the site of a mill. From February to April 1956 Gillian Hurst and John Hurst carried out an archaeological dig on the site. 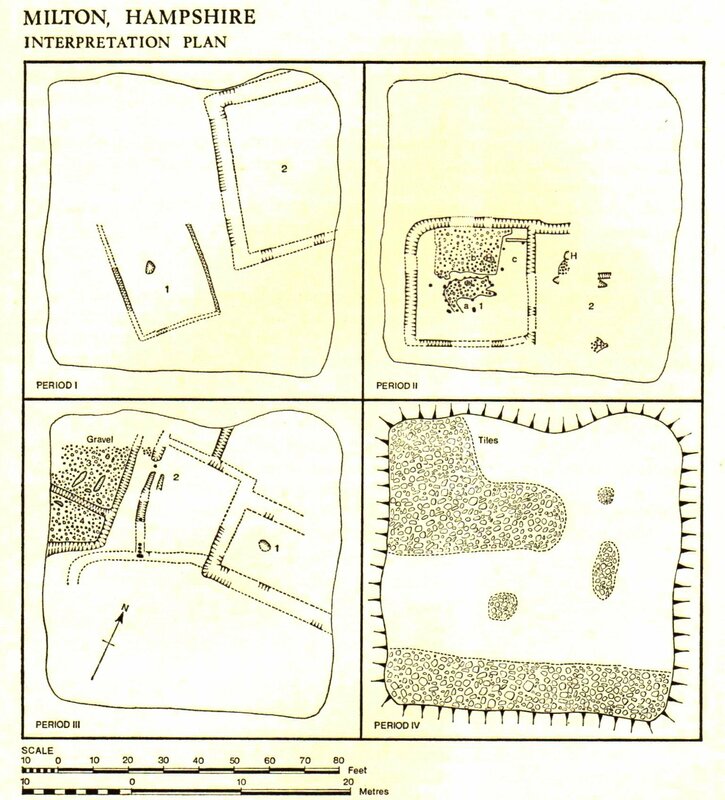 It is from their report, published in the British Archaeological Association Journal (1967) that this article is based. The dig was carried out fairly swiftly as the land, then owned by a Mrs E.L.Ring, was being developed for housing. There were 10 large oak trees on the site. The archaeologists were not permitted to excavate within 10 feet of each tree. This meant that a complete archaeological plan could not be produced. However 25 trenches were dug across the site. Gill and John Hurst unearthed a large number of features such as post holes, hearths, and foundation trenches. These were interpreted to show that there were 4 distinct periods of use of the land. The first period of use that was identified, revealed a rectangular enclosure 21ft wide and 30 ft long. Inside of this area was a 3 ft wide pit. The archaeologists suggested this might be a central post hole for a building. The enclosure consisted of a ditch 9 inches to 1ft 6 inches in width. This was suggested that it might have been a foundation trench for a horizontal beam of a building. A second feature of this period was another rectangular enclosure on the same alignment as the first. It was estimated that this would have been about 42ft by 30 ft in size. This second enclosure consisted of ditches 4 to 5 ft wide and filled with a black soil. Sadly there was no pottery or other dating material found. The second period of use unearthed shows that the structures on the site were aligned at an angle of 15 to 20 degrees clockwise to period one. There were another two enclosures adjacent to each other found in this area. The first enclosure was 31 ft by 29 ft. This was surrounded by a ditch 3 to 4 ft wide and 12 inches deep. Within this enclosure there were some finds. There was evidence of a hearth. In addition there were 12 post holes. The evidence was interpreted to be show that this was part of building. Near to this find was an area of gravel floor and more post holes. Immediately east and alongside of this structure was evidence of another area with a hearth and foundation trenches. Again sadly there was no pottery or artefacts to enable the archaeologists to date this period of use. 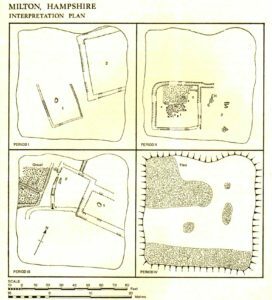 The evidence for a third period of building use on the site, suggests that the structures were situated a further 20 to 25 degrees clockwise from the previous period. 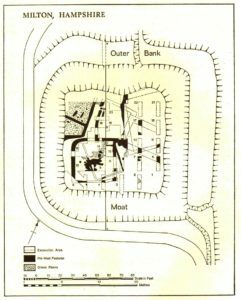 In the eastern part of the site there was a rectangular enclosure 32ft by 16ft. This was surrounded by a ditch 5 ft wide and 1 ft 3 inches deep. It is possible to show that this was a later feature as it cut through some of the archaeology of period 2. In the central part of the site there was further evidence of another structure. To the west of the site there was an area which had a gravel floor and more post holes. In this area some pottery was found which dated the site to medieval times well into the thirteenth century. In addition there was some evidence of iron smelting found in this layer of archaeology. 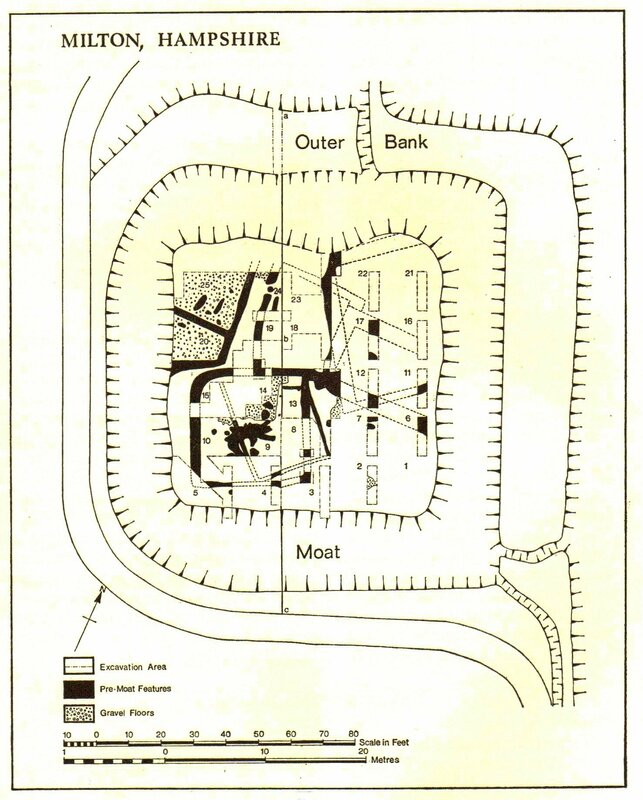 The final period of use for the site appears to be when the moat was dug. This was about 18 ft to 24 ft wide and encircled an area of about 80 Square feet. The digging of the moat cut through the earlier archaeology and the soil from the moat was thrown inside the enclosure covering the earlier archaeology. It also appears that earth and debris was brought into the site from elsewhere to assist in completely covering the area. This is evidenced by large amounts of pottery and roofing tile found throughout the layer of covering soil. The shards appear to be about 15th century. The historical finds were given to the Red House Museum in Christchurch. The archaeologists interpreted the four periods of use to show that this was not the site of a manorial property but several peasant dwellings. 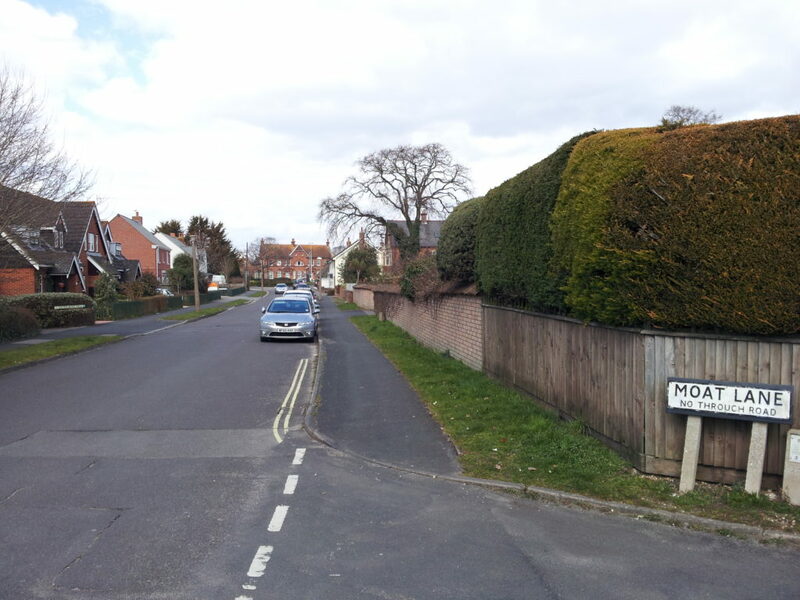 Gill and John Hurst in their report point out that these settlements with moats are very rare in Hampshire. Indeed the only other similar site in the UK found up until the 1960’s was in Ashwell in Hertfordshire. There are several reasons suggested for enclosing an area of land with a moat. It could have been for drainage or to keep livestock safe, or to protect farm buildings from fire, especially when burning off stubble. One thing the archaeologists were sure of, this is not the site of a fort or manor house.